I'm researching my great uncle, Guardsman Robert Shirkie (10054) of the Second Brigade, Scots Guards. My understanding is that he was with the 1st Battalion on 27th October 1915 as they were advancing towards "the Keep" and Puis 14bis, north of Loos. At some point he was killed, as he is recorded as MIA. Does this mean that his body was never recovered and therefore he has no known grave ? If so, I'd really appreciate knowing more about where he is likely to have been killed and more about what he had been asked to do as part of this battle. For the date, I guess it's September 27th and not October 27th. Here is the history of the Guards Division during the Battle of Loos from 26 to 28 September 1915. I will make this we pictures of different area to Loos or your great uncle is past. There is a good possibility - perhaps even a probability - that his body was recovered ; but that he could not be identified. He might have his name recorded on the panels at Dud Corner Cemetery as one of the thousands with no known grave ; yet he could well be buried in that very cemetery under a headstone bearing the words. A SOLDIER OF THE GREAT WAR Known Unto God. Editing : CWGC data reveal that he is commemorated on the panels of the Loos Memorial, date of death 27 September 1915.
no problem Michelle for the dud corner. I'm glad that you keep an eye on it Michel. Jean Fouquenelle who lives at Le Rutoir ( not the building with Freme Ruitoire but the one next to it) used to keep an eye on it, but he is 90 now and in failing health. wow... thankyou so much Michel. I am indebted to you for sharing the Cuthbert Headlam text. I will endeavour to find my own copy of this book. On initial reading of the pages you have shared, I am in awe at the sheer complexity of this battle and of the difficulties encountered in linking up so many different groups of men. This text gives me an idea of the brigades' actions, but I feel I owe it to Robert to understand more of how the 2nd Brigade's 1st Battalion worked their way out of the Chalk Pit Wood. 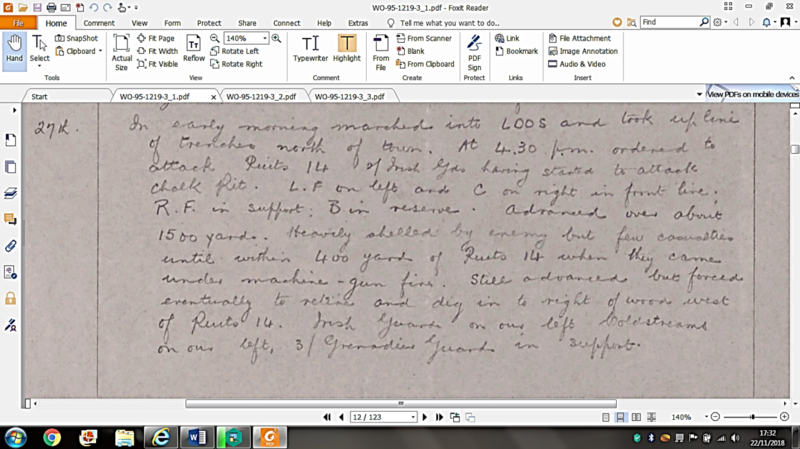 Headlam's text refers to heavy machine gun fire....would there have been mortar fire or other German artillery fire as well ? I gather that the battle was doomed from the start anyway, but how was this area eventually won ? I think I will try to get an idea of the topography leading up to Hill 70 ( was this an old slag heap as I understand the area was a mining area ?). Thankyou all so much for your help. I feel I am on the way to finding Robert's story. I'm glad that you keep an eye on it Michel. Jean Fouquenelle who lives at Le Rutoir ( not the building with Freme Ruitoire but the one next to it) used to keep an eye on it, but he is 90 now and in failing health﻿. I was present at the ceremony in September 1995 with Chr. JUPON. The ground was very muddy that day but with the sun. The hill 70 is the highest point on the north west side of Lens. It was a several kilometer long Colin that the Germans took from October 1914 to lose it only on August 15, 1917. Thanks again Michel..... I have found Google Earth really helpful to get an initial perspective on Hill 70 and the distances the 1st Battalion must have covered during their advance. I'm sure I can make out trench lines, long since ploughed over, but still visible from height. I am now trying to source more detail about the trench formations around Puis 14..... would you mind indicating where this would have been on the above map, and the houses which were called the Keep ? I'm doing this to you this weekend. Please see this thread which contains maps of Loos showing Hill 70 in square H 31 and Puits 14b in H 25. See also my link to the thread Panoramic views of Loos which has the pic I took from Hill 70 looking back with Loos on the left and the open ground to the north. Many thanks Brian.... I've followed your links through to previous thread as you suggested and seen your photos of the Loos area. I've also been reading the Long Long Trail site which shows just how complicated this whole battle was. Many details intrigue me.... for example Chris Baker's Long Long Trail states "3.30am : German troops go onto alert in front lines, orders having been given on receipt of information from an Indian deserter". Another is the confusion over the availability of the reserves at a point that they were needed. I look forward to seeing Michel's photos. Thankyou everyone for helping me to piece together Robert's story. I've tracked down the 1st Battalion's war diaries for September 2015 ( which are surprisingly detailed considering the circumstances when written). From the entry for 27th September can someone explain the acronyms/initials LF,C.RF.B. Interests:South Lancs Regiment and or anything else related to St.Helens men in WW1. It's their way of identifying the companies, the 1st Scots Guards had 4 companies: B, C, RF (Right Flank) & LF (Left Flank). There is a report of the operations on 27/09/1915 in the WD of 2 Guards Brigade (On Ancestry under Browse - Various (2 Guards Brigade) - Piece 1217/1-3. It is duplicated in the WD of the Guards Div HQ General Staff. No maps in either. Please forgive my ignorance, I'm new to archive research..... can you please explain how I might access this link you've sent ? Finally, the post-GW history of the Scots Guards is also available as a reprint HERE I find it a disappointing history but it completes the set for you! There is the free gratis official WW1 SG history available by download via this site. Naval "&, Military Press have a sale on this weekend, Headlam's history £11.99, and, 'Till The Trumpets' £16.00. Both are two-volume sets. Go on to Ancestry.co.uk and into the Military records. Select UK, War Diaries (France Belgium and Germany) 1914-1920. On the right is a box marked Browse this Collection. Select Various (2 Guards Brigade). It will ask you for Division but only give you the option of Guards Div. Then select Piece 1217/1-3 which covers 27/09/1915. For the Div WD select Divisional Headquarters - Guards Div - Piece 1190/1-4. The piece numbers are the National Archives references WO 95/1217 and WO 95/1190. At one time you could simply put the reference into the Keywords box (less the WO 95) and leave everything else blank but that does not seem to work for me now. I think Ancestry is gearing up to putting all military on to Fold 3 and make us pay even more for access. Your local library should have access to Ancestry.co.uk if you do not subscribe or you can download from TNA. In the Div HQ it is always a good idea to read the WD of the Adjutant and Quarter-Master General where you will normally find Routine Orders showing Honours and Rewards. White traces in the fields are the old trenches.. If you need more photos of loos and its surroundings, I'll be happy to help.